wilderness aboard the world’s largest rotating tramcar. 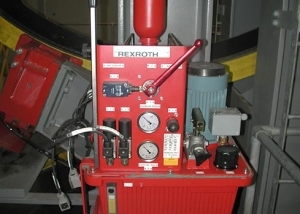 The hydraulic system, which is adjacent to the main drive wheel, controls the docking brake used as the cars come into the stations. 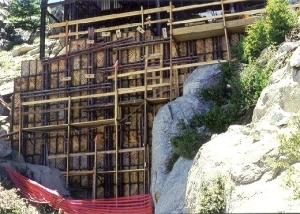 This view shows the forms used for a 130yd concrete pour to secure additional steel structure during the remodel. 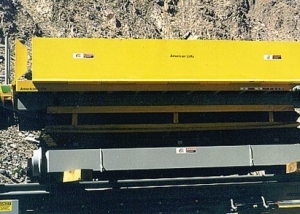 The scissor lift, pictured here, is used to attach water tanks or heavy freight and equipment to the underside of the cabins. 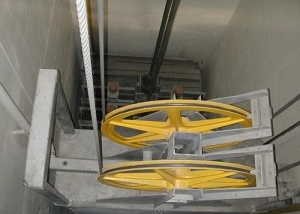 The rescue drive counterweight provides a method to lower the cars to the Valley Station with the use of gravity only. 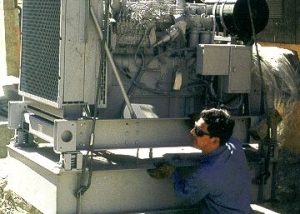 Being set into place is a Cummins 6 Cylinder 190hp hydrostatic drive, used as a back up to the main drive. 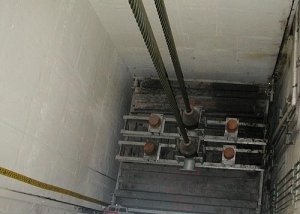 Seen at the bottom of the well is the track rope counter-weight, which keeps tension on the track cables as the cars travel between towers. It weighs approximately 120 tons. Shown just prior to installation are the bull wheels which guide the haul rope in and out of the buildings and to the main drive wheel. 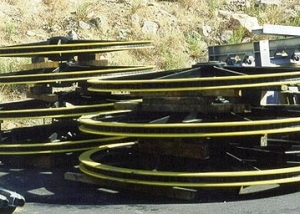 There are two of these wheels at the Mountain station that help suspend the haul rope counterweight. 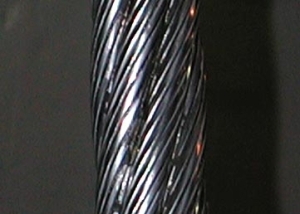 A detail shot of the 40mm compacted hauling cable. Both cabins are attached to this cable which spans the distance from the Valley Station to the Mountain Station. It is 13,100 ft long and weighs 4.22 lbs. per foot.